In what might be seen as a measure of its growing confidence in the face of an old adversary, or simply a bluff, Iran has raised the prospect of its navy sailing close to U.S. coastal waters. The announcement comes after Iranian warships sailed the Suez Canal earlier this year to dock at Syria’s Lattakia Port. 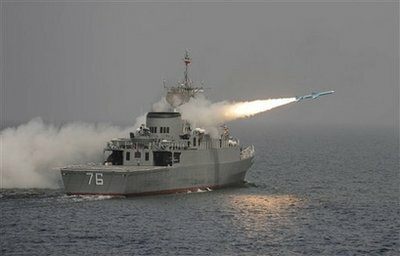 In recent years Iran has added submarines and warships to its navy, including the Jamaran, a 1,500 tonne vessel armed with missiles, torpedoes and naval canons. Launched in early 2010, the Jamaran is Iran’s first domestically designed and built frigate. Others are expected to follow as Iran asserts control over its territorial waters and the Persian Gulf, through which 40% of the world’s oil passes. In addition to unveiling new anti-ship cruise missiles, Iran has also expanded its sphere of naval operations recently, embarking on patrols in the Red Sea and anti-piracy operations in the Gulf of Aden. According to Admiral Sayyari, Iran’s Supreme Leader Ayatollah Khamenei has ordered that the navy be turned into a strategic force. Consequently Iran “plans to widen its presence in the high seas in a bid to protect the country’s interests and provide security for the country’s shipping lines,” he said. Admiral Sayyari told Fars News Agency in July that Iran’s navy might soon be despatched to Atlantic. If that were to happen Venezuela would be a likely port of call as Iran is on good terms with the South American nation. Admiral Sayyari’s announcement comes amid continuing tensions with the U.S. and Israel, which have accused Iran of having a covert nuclear weapons program. Iran denies the accusations but both the U.S. and Israel have hinted that a military option remains open if diplomacy fails to resolve the dispute. If that happens, analysts say that Iran would likely retaliate by targeting Israel and U.S. military bases in the Middle East, all of which are within range of Iran’s arsenal of domestically developed medium range missiles.